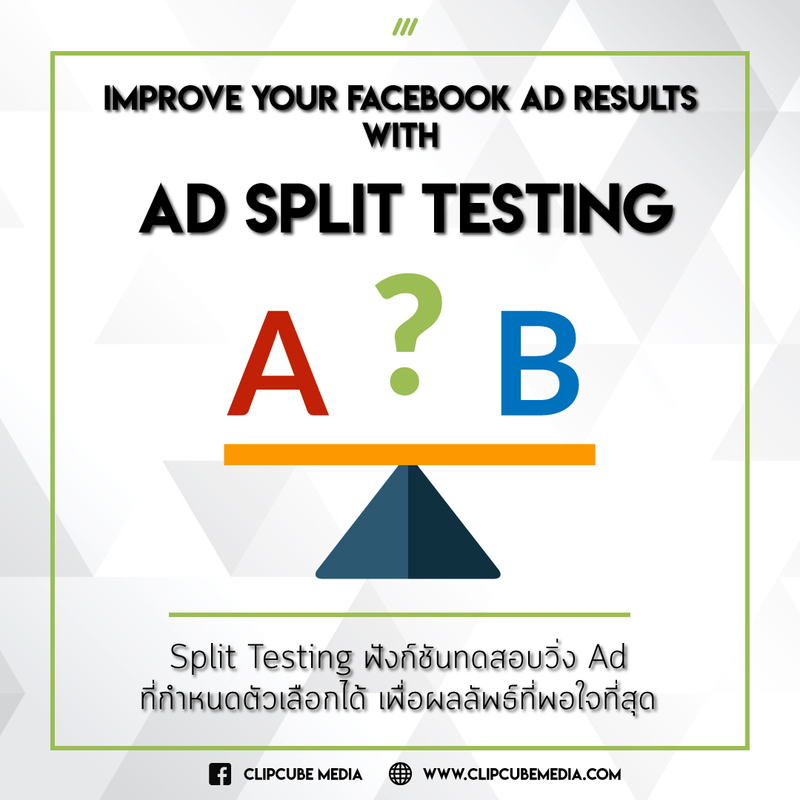 เมื่อคุณสร้าง Ad ขึ้นมา จะมีตัวเลือก Split Test ให้คุณได้เลือกเปิดใช้งาน เมื่อกดเปิดใช้งาน จะมีกล่องแสดงตัวแปรขึ้นมา โดยคุณสามารถเลือกตัวแปรที่ต้องการทดสอบกับ Ad ได้ที่นี่ ขึ้นอยู่กับผลลัพธ์ที่คุณต้องการ ตัวอย่างเช่น การเลือก audience ที่ต่างกันแล้วนำมา split test, หลังจากนั้นสามารถตั้งจำนวน Ad set ที่ต้องการโดยมี audience ที่ต่างกันเพื่อนำมาวัดผล. ClipCube Media provides social media managment, content creation and video production service in Bangkok. It is not enough just ot post and create content. We must understand who we are creating the content for and how to best target and reach the audience. Facebook split testing is a powerful tool you can use yourself. Here is an overview of what it is all about. 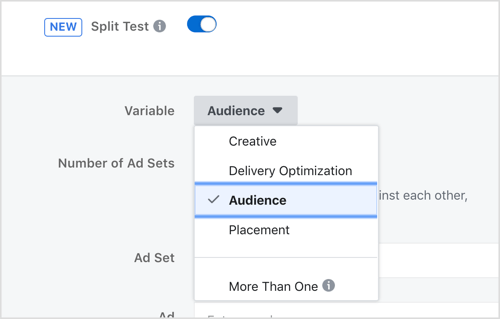 One pre requisite in using the Split Test feature is to have a Facebook Business Ad Manager set up.This is where it all happens. 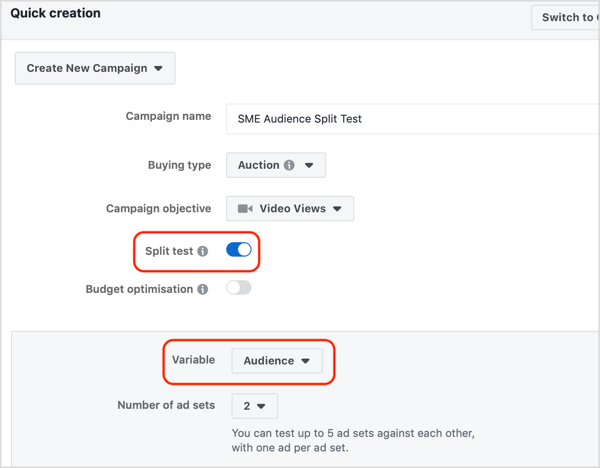 The split test feature lets you test 5 different variables against each other to discover which ones deliver the best results based on your campaign goal. It will also provide you an estimate cost per result for each ad set. These variables include ads, delivery optimization, audiences, placement, amongst other variables. By using it through out your different campaigns you can target the different the variable's. In the case of audience you can see the temperatures and engage with people at different levels of awareness and consideration for your products or services. When you create an ad, there will be a Split test option for you to switch on or off. Switch on the option and the variables box will appear. You can select the variable here depending on what result you want. In the example, select the audience as variable, you can then select the number of ad sets you want to test against. The cost of each ad set will calculated and compared with the other. The ad set with the lowest cost per result will win the test. After the test is complete, Facebook will email you the results and highlight the winning test variable. Last but not least, do not forget that doing the split test means comparing the results between your different settings of you ads. Try creating multiple ad sets with different variables. Name the ad sets accordingly to avoid confusion. Make sure that each ad sets contain different variable. ClipCube Media provides cross platform Social Media services. We can manage posts, ads, and promote contents for your facebook page with effective results based on your campaign plans or KPIs. ClipCube Media also provides other digital media services include Video Production and promotion / Photography / Audio and Video Studios, Workspace, and Equipment Rental / Web Design, Support, and Hosting / Newsletter Development and Distribution / Mobile and Web Application Development / Graphic Design, Brochure, Newsletter, Directory Design and Publishing / Event Management and Promotion / Onsite and Offsite SEO / Google Adwords / Brand Consulting and Planning.